771 Yonge Street is a new pre-construction condo project by Menkes Development Ltd located at the intersection of Yonge/Cumberland in Yorkville. In recent years, the intersection of Yonge and Bloor has been the site of some of Toronto's tallest residential buildings, the 76-storey 1 Bloor East nearing completion and possibly beside it the 84-storey The One. The surrounding Bloor-Yorkville area has also been a up and coming area for new development, as abundance of point towers surrounds the neighbourhood into one of our central high-rise clusters. New Menkes Developments proposal at 771 Yonge Street—just north of Bloor will be a slender 49-storey residential tower to be built across Asquith Avenue next to the Toronto Reference Library. Located at the southeast corner of Yonge and Asquith, the Wallman Architects-designed tower would keep the heritage building at 771 Yonge and restored, with the residential entrance new retail—fronting Asquith Avenue. The 322-unit tower would rise to a height of 154.1 metres, with a 7.0 metre mechanical penthouse taking the total height to 161.1 metres. New proposed configurations would add 46 bachelor, 92 one bedroom, 92 one bedroom + den, 46 two-bedroom, and 46 two-bedroom + den, suites for sale. With a floorplate of 493 m², the point tower's slim form follows the rules of the Planning & Urban Design Rationale provided by Bousfields Inc. But it is well below the recommended standard of 750 m². On top of a three-storey podium, the tower would be set back 10 metres from the west property line of the main street, and approximately 4.5 and 4 metres from the north and east property lines respectively. The condo tower will be located in the Yorkville neighbourhood, one of Toronto's most prestigious and very popular districts. Nearby schools include School & Clinicacupuncture, Academy Of Learning, Corinthian College and Hi-Tech Network. For the ones who love the outdoors and walking there are beautiful parks close by such as Harold Town Park, Four Seasons Parkette, Asquith Green Park and George Hislop Park. Nearby transist options are virtually unlimited with many transit stations very close by such as Bloor-Yonge Station, Bay Station, Rosedale Bus Station, Rosedale Station and Museum Station. With a walk score of 100 and a transit score of 97, 771 Yonge Street is an extremely accessible neighbourhood. 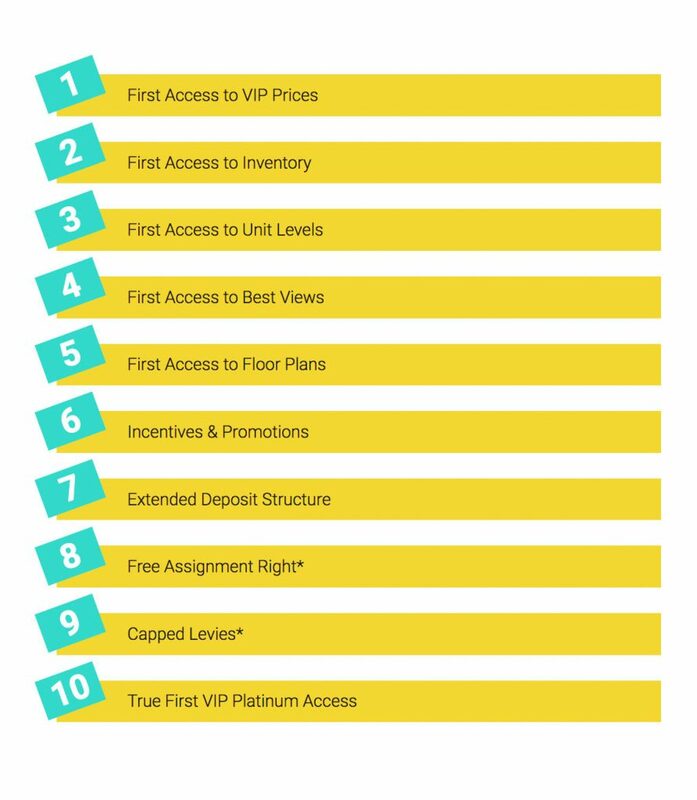 There’s a certainty that 771 Yonge Condos is located in a very popular area which has great appeal to both prospective buyers and investors alike. The proposed 49 storey residential tower will be built among other high end developments such as 1 Bloor East and The One, and sit just north of Bloor on the southeast corner of Yonge and Asquith. High-quality urban design is an essential ingredient for building a great city. From the largest-scale plans down to the smallest site and building details, urban designers strive at every level to create beautiful, vibrant, safe and inclusive places. 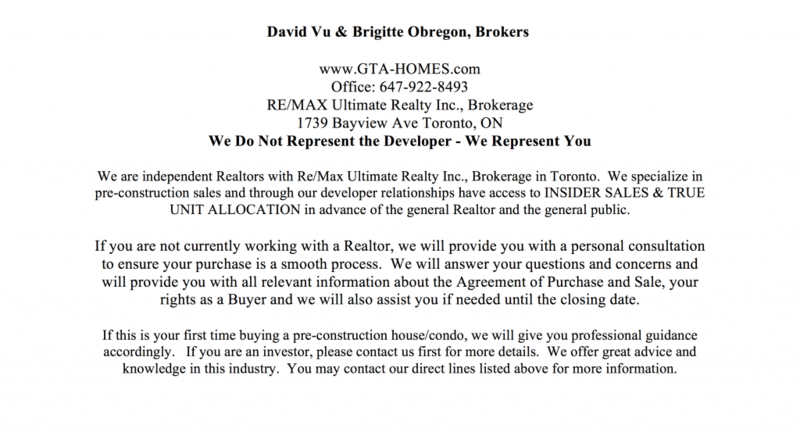 771 Yonge Street is in Yorkville an affluent neighbourhood in Toronto, Ontario, Canada. It is roughly bounded by Bloor Street to the south, Davenport Road to the north, Mt Pleasant Rd to the east and Avenue Road to the west. 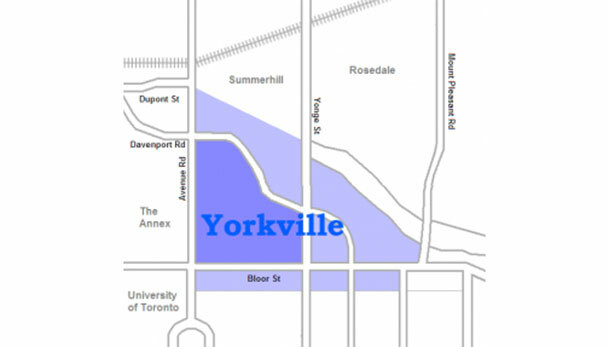 Yorkville is diverse, comprising residential areas, office space, and an array of shopping options. The new condos would share a wall with the former Alfred Britnell Bookstore which is now a Starbucks, which would effectively be put between the two high-rise towers. With the City of Toronto's Tall Building Guidelines setting out an optimal tower separation of 25 metres, the site's very tight configuration could prove a long outstanding issue in the approvals process. When talking about the height, the site sits just north of the Yonge-Bloor heights set out in Area Specific Policy 211. 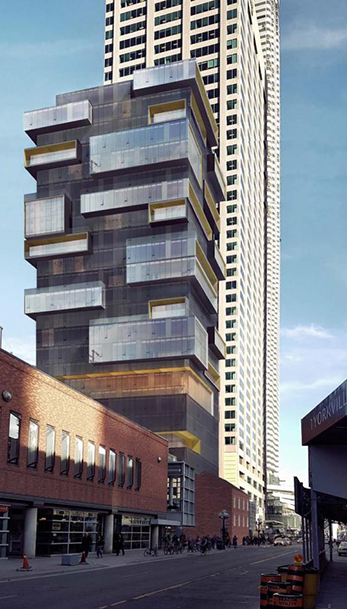 The 49-storey tower would rise above the 132-metre 2 Bloor East to the south. With a number of taller projects currently underway, the 58-storey 1 Yorkville tower just up the street —the height of the development is in similar in scale to some of the recently approved towers in this area of the height ridge. 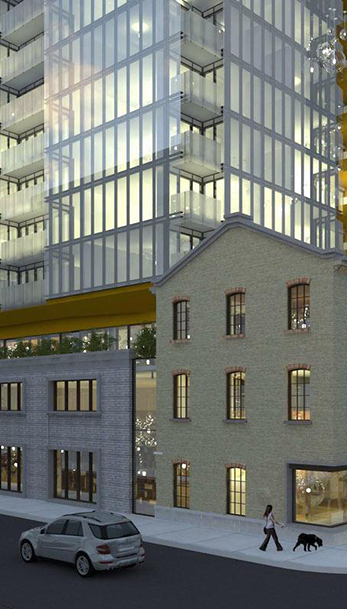 The second floor of the restored heritage structure at 771 Yonge would cover some of the residential amenities, which would also be spread out across the third floor of the podium. Although parking for cars is not planned for the development, they will be a total of 330 bicycle spaces proposed, meeting the City's minimum requirement of a 1/1 ratio of units and bicycle spots. A single underground level would provide a direct walkway to the Hudson Bay complex to the south. The project also includes landscaping by the NAK Design Group, with outdoor green space on the second level. The location 771 Yonge Street is already vibrant and full of the multicultural faces of Toronto, you have an abundance of small businesses and retail - home of luxurious shopping including Holt Renfrew, Harry Rosen, Gucci, Hermes, Burberry, Rolex and much more -Steps to Toronto's top restaurants and cafe's. Menkes develops many projects and the other project that its also in the planing stages is 4800 Yonge Street which this development will have 536 units and will launch in 2017. Once a refuge of hippies and folk singers, Yorkvillle has changed over the last forty years to become one of the city's vibrant and classy neighbourhoods, along with some of the city's best restaurants and hotels, to some of the most well-kept Victorian row-homes in Toronto. A walkers paradise and a transit heaven, this beloved Toronto neighbourhood has become a nexus of wealth and style, with condo and home prices that very much reflect its ever-increasing exclusivity. 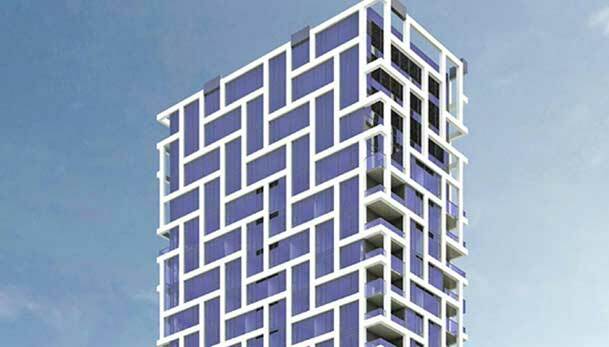 New Condos By Menkes & Wallman Architects in Toronto's Bloor-Yorkville Neighbourhood!